The other day two friends, living a thousand miles apart, told The Joyful Hermit they are experiencing sore throats and sniffles. 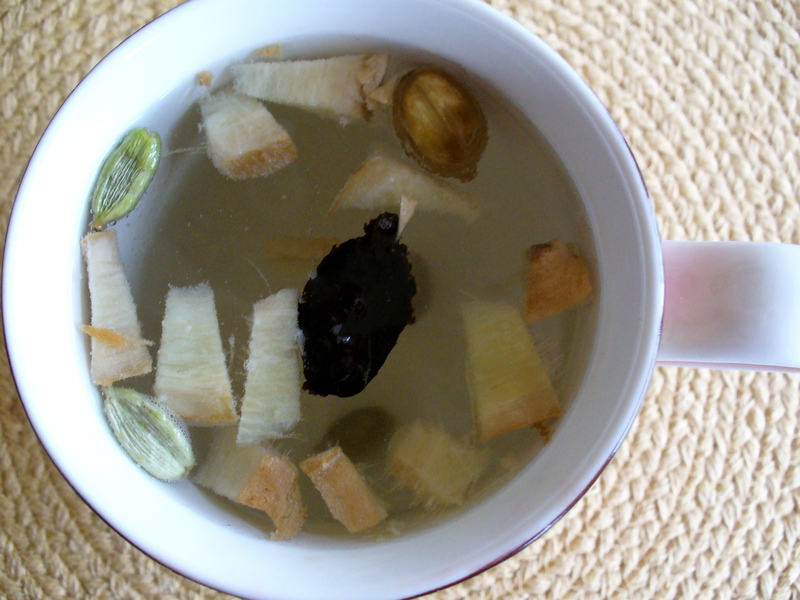 Think healing: JH is sipping hot water in which steeps sliced, fresh ginger, three green cardamon seed pods, and one black. Drinking fresh ginger “tea” is supposed to help ward off colds. Joyful has been drinking it also with the cardamon [eat the seeds later] for immune system strengthening, plus it is very soothing to the stomach. JH has to keep tummy happy due to the many aspirin-type pain relievers taken daily; but at Christmas a daughter with upset stomach said the hot, fresh ginger “tea” relieved the indigestion. 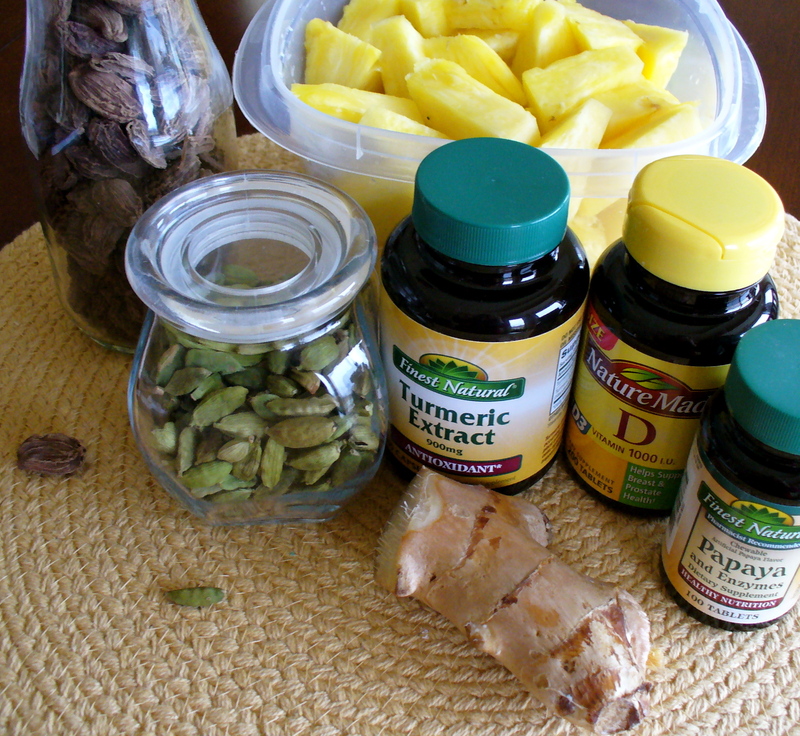 There are some expenses involved in developing an arsenal of natural, helpful preventative aids. The black cardamon cost $9.95 for a large bag at a nearby India food store. The green cardamon (sweeter flavor) was $4.95 for a small bag but has twice the cardamon pods (compare size in photo). Pictured, also, is a hunk of fresh ginger root (stays fresh in wax liner bag, refrigerated). Pineapple and papaya are helpful for those needing anti-inflammatory aid. JH is trying out a tumeric extract capsule each morning; turmeric helps lower cholesterol, boosts immune system, and balances the brain. Paid $19.95 for buy one, get one free, at Walgreens. Watch for these periodic sales; get double for price. Vitamin D is touted to help in various body-mind issues. JH takes up to 5000 iu’s a day in winter when there is less sun here, and D is also recommended for chronic pain. The whole array is an investment that has produced positive results this year. I had a pain set-back but had let the Vitamin D slip. Otherwise, no colds or doctor visits since Joyful started drinking hot water, laced with fresh ginger and cardamon, on a regular basis. Sometimes JH drinks green or black tea steeped with the cardamon, as mentioned, and sipping now. Cheers, from The Joyful Hermit!